Sheriff Barry Babb at the County Commission workshop. Photo/Ben Nelms. A portion of the April 5 Fayette County Commission retreat had commissioners by consensus tasking County Administrator Steve Rapson with presenting a 2020 budget that includes additional compensation and retention for public safety and all county employees. That consensus was preceded by a presentation by Sheriff Barry Babb. The total package, if approved by commissioners in the upcoming county budget, totals $3.74 million and includes a 9.09 percent increase for all public safety employees, a merit increase for all other county employees with an effective rate of 3.25 percent, an increase in the employee retirement multiplier and the 8.4 percent cost of the employee healthcare renewal. Babb’s presentation came prior to the agenda item discussion on compensation increases. Babb came armed with a wealth of data, which made the case for the need to address deputies’ pay and retention. “We’re in a bidding war and we’re bleeding,” Babb said, noting that local agencies and those statewide and beyond are increasingly raising pay. Citing examples, Babb said Coweta County deputies start at approximately $42,000 and Georgia State Patrol recently increased starting pay to $45,000. The current starting pay for Fayette deputies is $38,609, below the starting pay of both Fayetteville and Peachtree City. Commissioners after the presentation discussed options laid out by Rapson that could address Babb’s concerns on pay, retirement and retention. Rapson addressed those concerns, not only for sheriff’s office employees, but for all public safety employees and the remainder of the county workforce. The consensus was to have Rapson, when working up the coming budget, address the preferred option without increasing the millage rate, if possible. That option included a 9.09 percent pay increase for all public safety employees and a merit increase for other county employees based on a 5 percent forced bell curve with an effective increase of 3.25 percent, for an estimated total of $2.36 million. Public safety employees represent 53.5 percent of the county government workforce. Commissioners by consensus also supported the cost of county employee healthcare renewal at 8.4 percent totaling $690,829, and an increase in the employee retirement multiplier from 1.5 to 2.0 at a cost of $688,131. County employees would have their individual contribution increased to 5 percent from the current 2.5 percent. The grand total came to $3.74 million. Commissioners will take up the issue again when budget talks begin in the coming weeks. Specific to sheriff’s deputies, the increase will take the starting pay from $38,609 to $42,117. 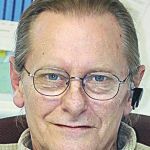 A pay increase is needed, Babb said, because his office continues to lose deputies to other agencies, including local agencies, whose local officials have increased law enforcement pay and/or strengthened retirement plans. It was during the aftermath of the Great Recession that Fayetteville, then with lower pay, lost officers to the sheriff’s office and other agencies. Today, and now that Fayetteville and others have increased their pay, the sheriff’s office is losing deputies to those agencies. Babb’s point was that, today, the bidding war for law enforcement staff continues to increase in scope far beyond the geographic boundaries of Fayette County. Elaborating on the current status, Babb said since Jan. 1 his office currently has 18 deputy vacancies, or 12 percent. In 2018, the loss of 25 deputies resulted in patrols being staffed by seven deputies or less 79 percent of the time. Deputies leaving the sheriff’s office in 2018 went to agencies in Acworth, Peachtree City, Fayetteville, Pinewood Atlanta Studios, State Farm Insurance, MARTA, Newnan, Clayton County, Grantville, Spalding County and Georgia State Patrol. Following the presentations by Babb and Rapson, commissioners weighed-in on the topic. Commissioner Eric Maxwell said he had no problem with the proposals, though he did have an issue if a tax increase is subsequently proposed. Saying that he made a commitment not to raise taxes, Maxwell said he wanted to talk about where the dollars would be found to pay for the option without a tax increase. Chairman Randy Ognio and Commissioner Charles Rousseau were clear in their support for the option. Rousseau said he supported the option and would advocate for it. Babb at the outset of the discussion provided a look at the crime statistics for 2018, which included items such as serious crime locations, times of day and days of the week for crime occurrences, crash analysis by locations and times, comparisons of serious crimes over the past two decades, deputy response times, traffic stops and the number of arrests. Babb also provided significant detail referencing the variables, and the dilemmas currently facing his office, involved in recruiting and retaining deputies and correctional officers and the expense to taxpayers when those employees cannot be retained when better pay and retirement offers are made by other agencies. One of the points made by Babb dealt with a comparison of 14 other full-service sheriff’s offices and with populations ranging from 67,000 to 250,000. Fayette’s estimated population is 114,000. 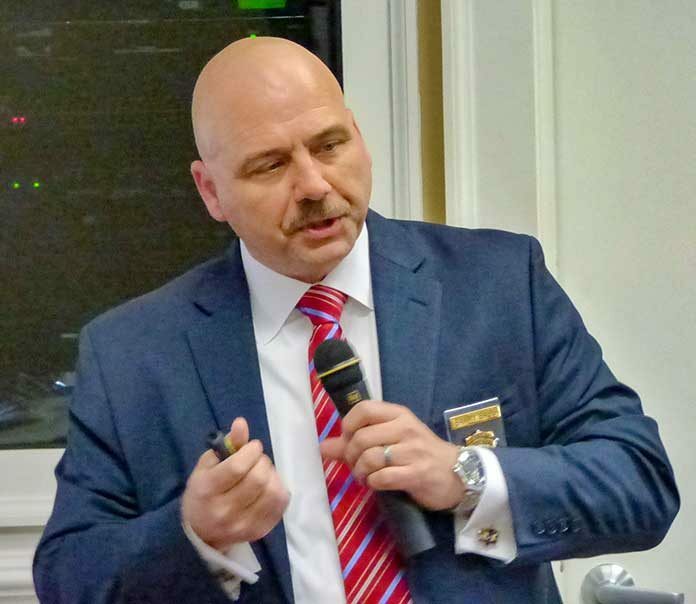 Pertinent to the presentation was a given county’s statewide rank in terms of median income and the deputy-to-citizen ratio of the respective sheriff’s offices. Though Babb was not making the case for hiring additional deputies, the data was telling. For example, Fayette ranks No. 2 statewide of Georgia’s 159 counties in median income and has one deputy for 750 citizens. Bartow County with a population of 103,000 ranks No. 30 in median income has one deputy for 563 citizens, while Newton County with a population of 115,000 ranks No. 28 in median income and has one deputy per 596 citizens. 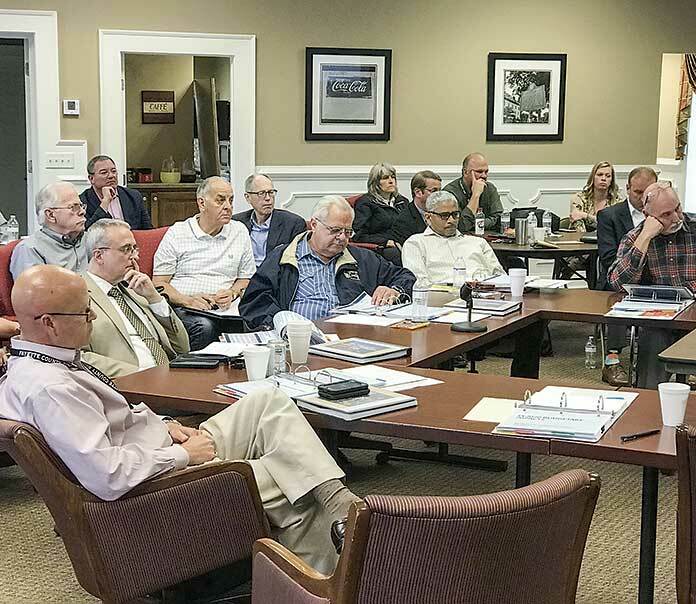 Fayette County commissioners at the April 5 retreat, seated from left, included commissioners Edge Gibbons, Chuck Oddo, Chairman Randy Ognio and commissioners Charles Rousseau and Eric Maxwell. Photo/Ben Nelms. Next articleSay bad stuff about Peachtree City officials and get sued — by the city government itself?